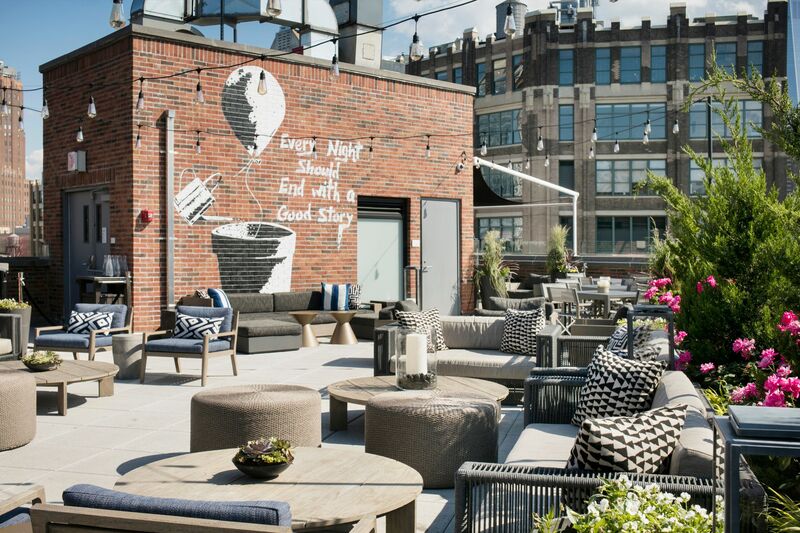 Raise a glass to spectacular views and refreshing cocktails at the best rooftop bars NYC has to offer this summer 2019. 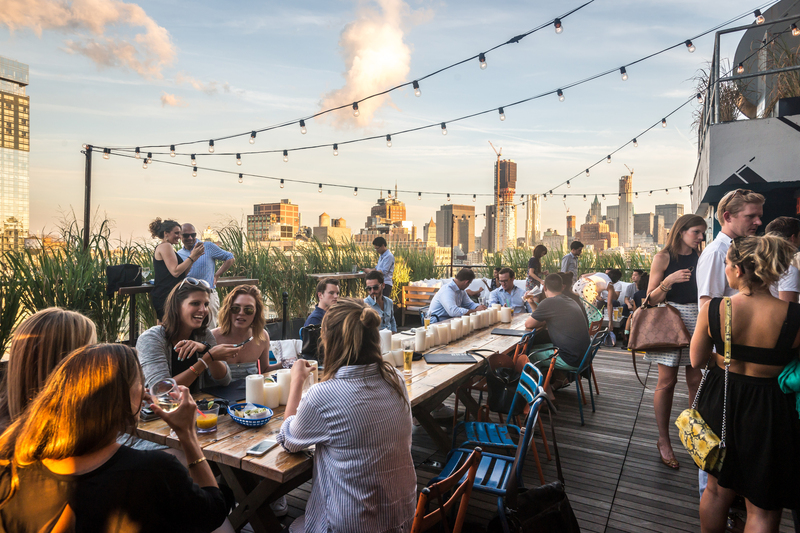 When it comes to things to do outside with the best views in nyc, rooftop restaurants are where it’s at. 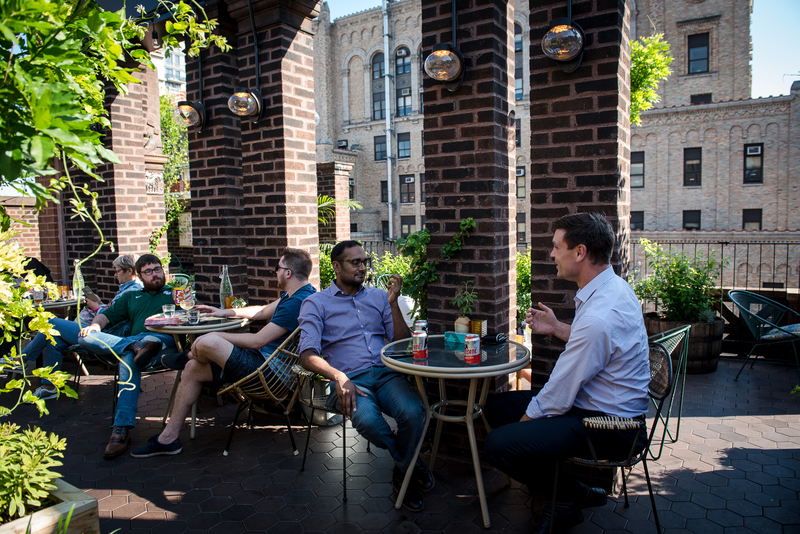 Whether you’re looking to grab afterwork drinks with coworkers or a spot for an early-game Tinder date, we know how to make the warm weather remain a breeze. 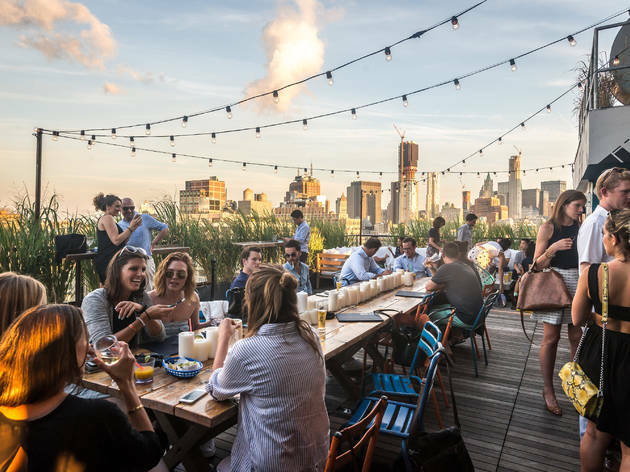 From dive bars in Bushwick to fancy shmancy sky-high nights in Midtown, raise a glass to the best rooftop bars you can find us at all summer long. 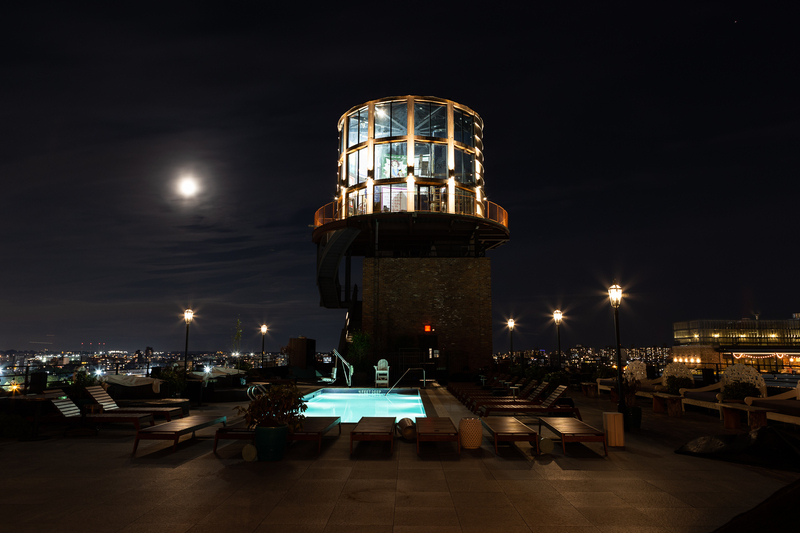 What is more New York than a rooftop bar set in a water tower? This aptly-titled Williamsburg Hotel cocktail bar sits in the cylindrical structure above the hotel's outdoor pool. 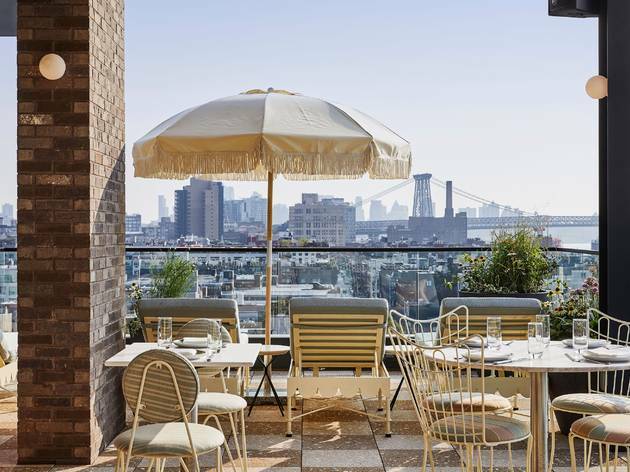 Glorious views of Williamsburg, the East River and Manhattan can be enjoyed from the steel-encased, floor-to-ceiling windows. The inside is decked out with velvet couches and chaises and the back wall is covered in murals painted by local artists. 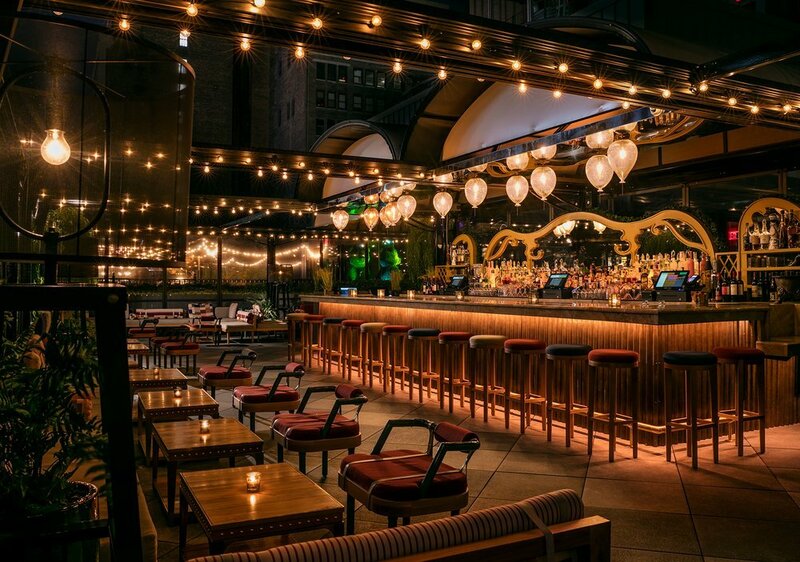 Overlooking the Chrysler and Empire State buildings, this top-notch cocktail haunt sits perched atop Gramercy's Park South Hotel. The copper-sided lounge is decked out with cantilevered banquettes, sunset-orange canopies and a crackling glass-front fireplace. Pro tip: Snag a seat near the hearth to keep you toasty on breezy summer nights—if the flowing Negronis (fortified with fruit-forward grappa) haven’t warmed you up already. 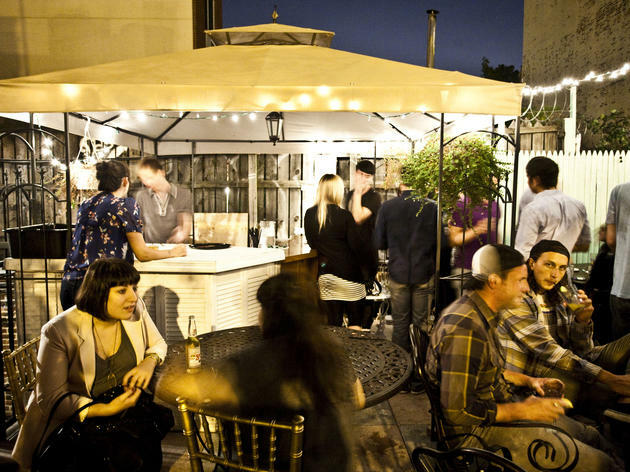 While the classic quaffs are well executed, there are also over a dozen local and imported beers and just as many wines available for alfresco sipping. 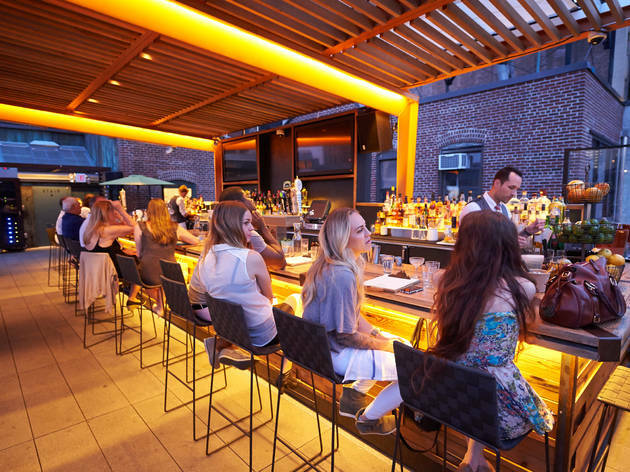 The bar also elevates pub fare for its small-plates operation, serving wagyu cheeseburgers crowned with dashi pickles, truffle-parmesan fries, and achiote-marinated shrimp skewers. 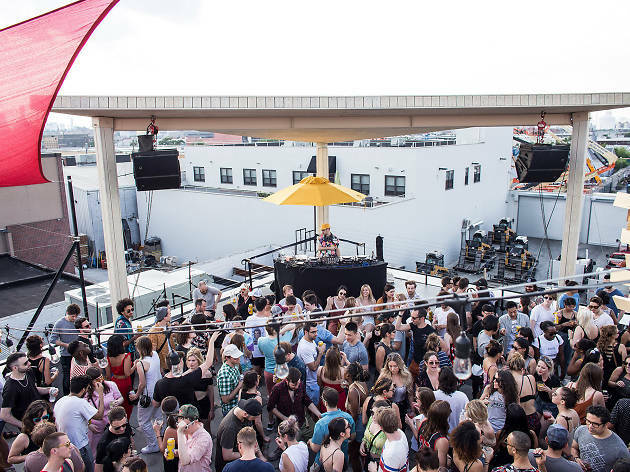 Whether you’re sweaty from dancing at Elsewhere’s club or from the szechuan at the downstairs Bushwick Mission Chinese, you might want to cool off at Elsewhere’s rooftop bar. Elsewhere isn’t exactly where you’d go if you wanted a relaxing, quiet drink for a “we need to talk” talk. 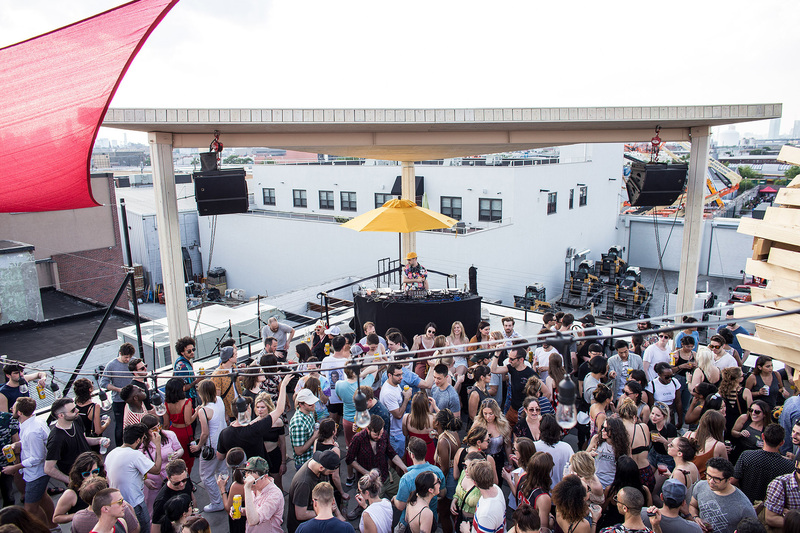 The dancing continues upstairs with a stage on their rooftop where you can see some of the best djs spin; perfect for any warm-weather weekend night that has many acts. While we can't all be in Martha's Vineyard this summer, luckily fare at the Summerly is inspired by New England coastal dining. 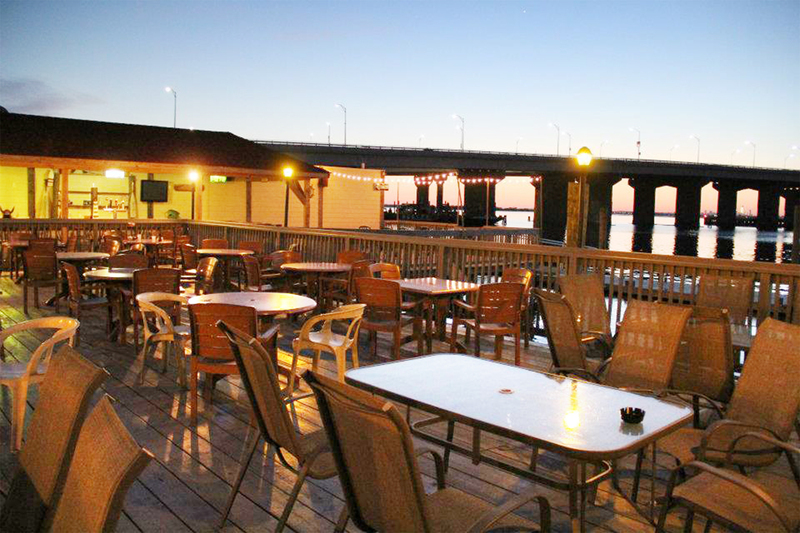 Pair cocktails with a side of clam pie, lobster rolls, or corn fritters and pretend you're by the beach. What's also great about Summerly is that you can escape the circus of the Williamsburg sidewalk at night. While lounging amongst soothing pastel interiors, enjoy high-in-the-sky views of the East River. That is, without being inundated by Vineyard Vines bros. On Sundays the theme becomes especially apparent, with traditional New England clam bakes. Fans of Sleep No More will love Punchdrunk’s interactive theater piece at the McKittrick Hotel. 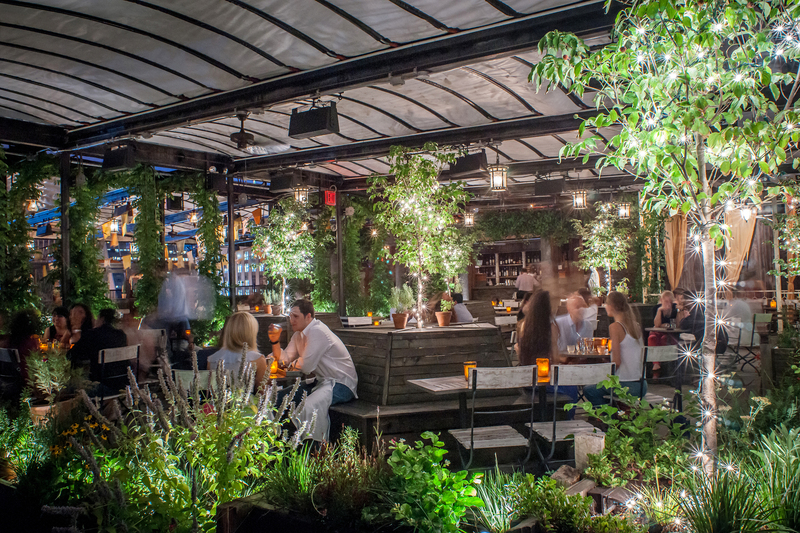 Named after a Scottish field where accused witches were hanged, Gallow Green has the feel of a garden party thrown at an abandoned farm. 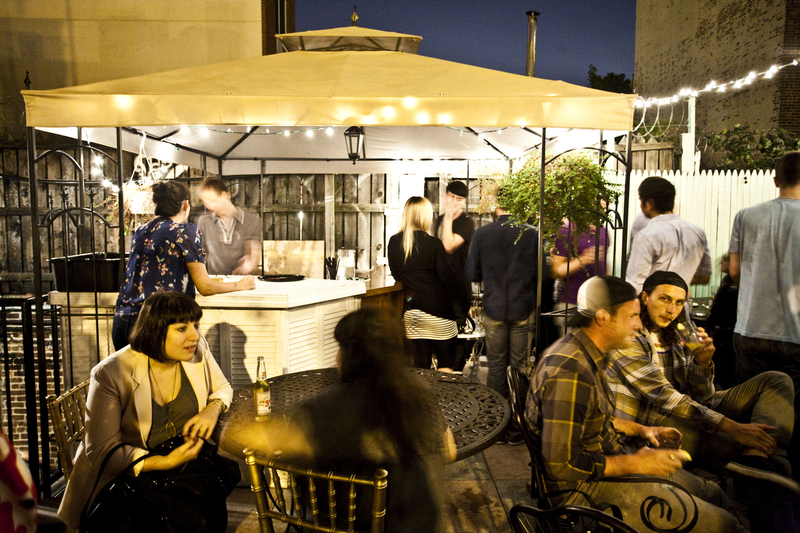 Fairy lights and tattered flags hang between verdant trellises; bartenders sling cocktails served by wait staff dressed in ghostly whites. The best seats in the house are inside an artfully ruined antique railcar, whose empty windows are hung with destroyed lace curtains. This Broken Shaker has the same electrifying energy as the Miami original. 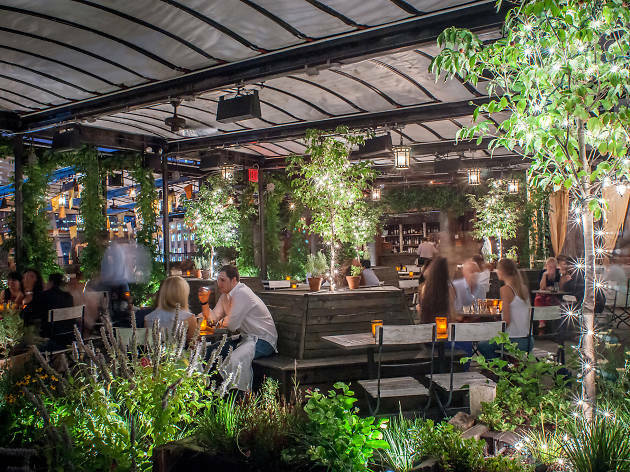 And yeah, the Broken Shaker may not be new, but it’s still one of the only truly cool places in Gramercy for rooftop drinks. 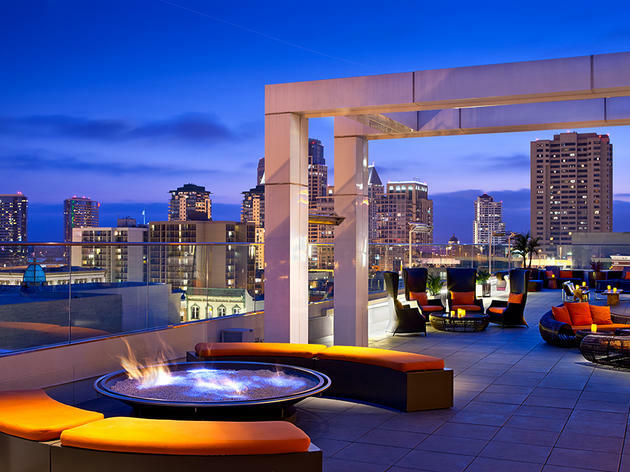 In addition to this oasis’s indoor bar, the 18th floor terrace area is one of our favorite places to blow off steam in the whole city. 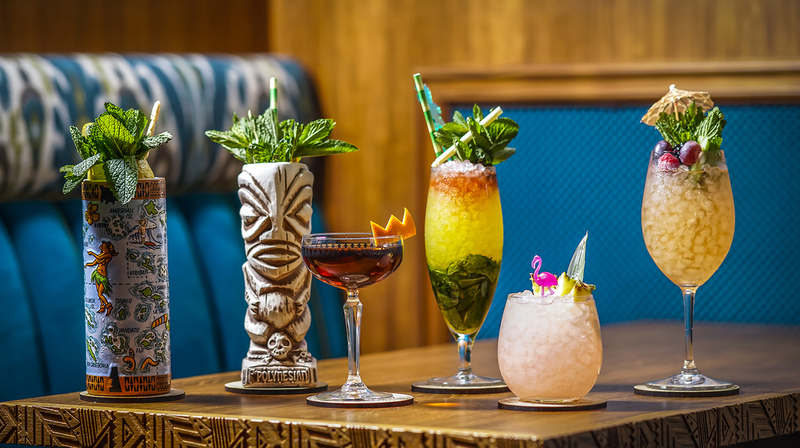 And what better way to do so than with one of their signature tropical drinks, sailing you into summer? Brunch will be rolling out soon, too. 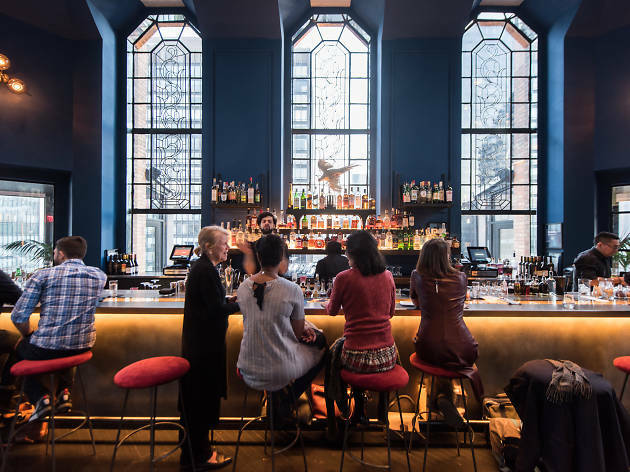 In the 2019 follow-up to Dear Irving, this bi-level cocktail bar offers an “Ode to The Empire State”; all spirits are made right here in New York. 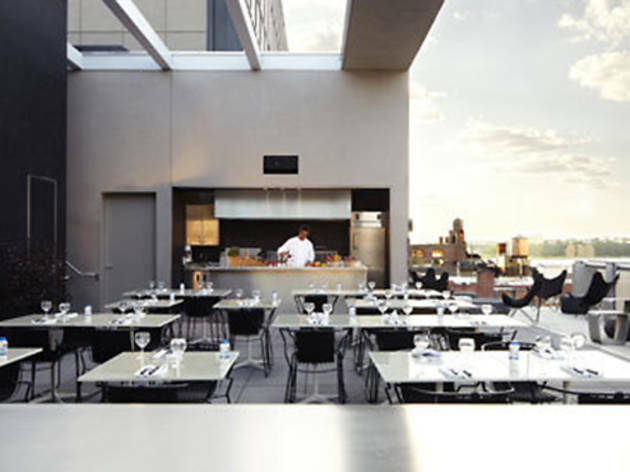 Located in the Aliz Hotel in Times Square, Dear Irving on Hudson is surprisingly chic given the location. Velvet couches, brass finishes and rounded doorways seem straight out of the set design for a 1960’s James Bond movie. And after a couple of drinks, you might just get into your own espionage. 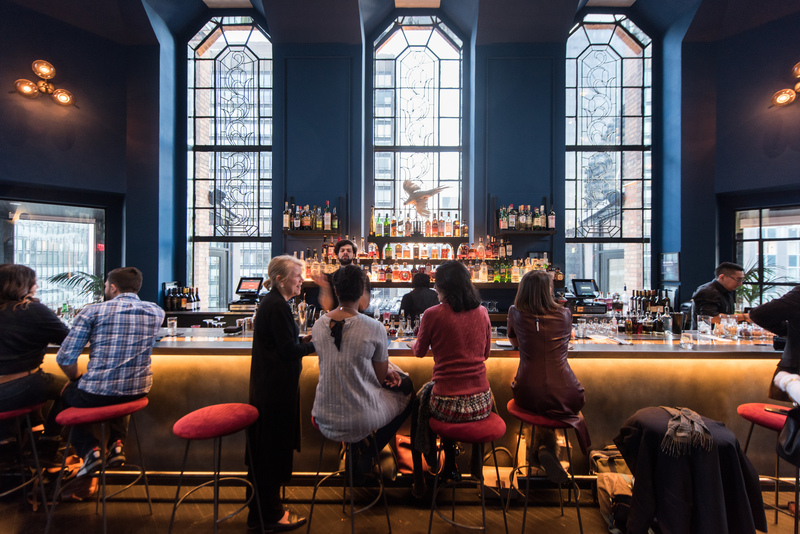 Rather than a spot for Saturday night raucous, Ophelia is the kind of quiet bar you’d go to read an Elena Ferrante book alone or meet up with someone you had to tell a secret to. 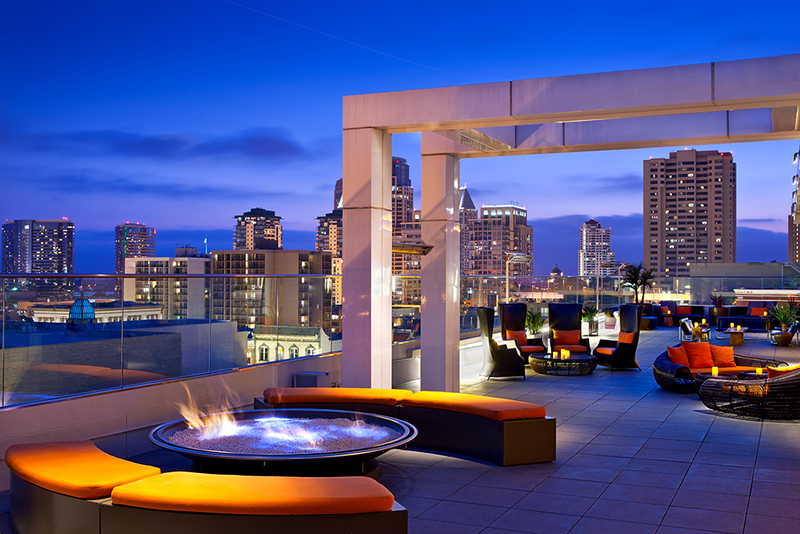 But that doesn’t mean it’s not one of the best rooftop bars across the city. 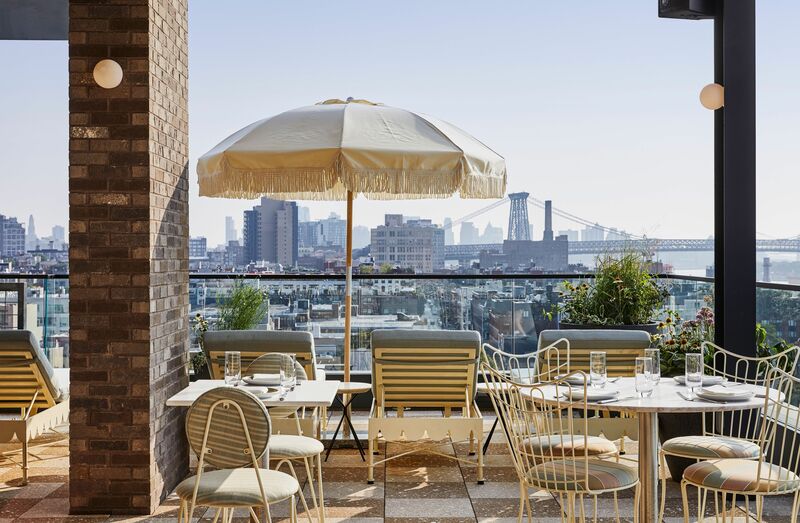 Fashioned with soaring cathedral windows that look out onto the East River, jewel-tone blue walls and glass showcases filled with vintage oddities, this is one of the most elegant rooftop experiences New York has to offer. What other bar in New York can say they have mini golf, too? And this isn’t just any mini golf course. Named Foreplay, here you’ll find animals in NSFW positions who bring the magic all night long. Whether with friends or a date, the sheer whimsy of it all is a great way to loosen up, with clear talking points built-in. Westlight is a stylish glass box capping the neighborhood’s tallest skyscraper. 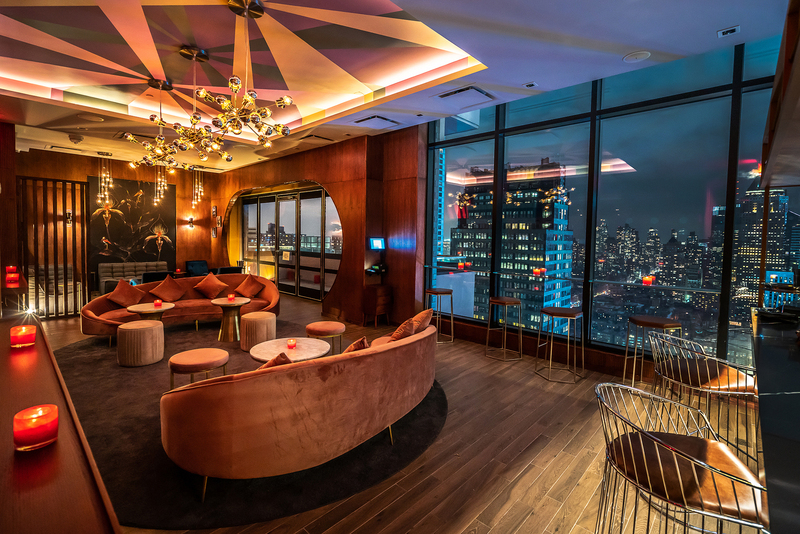 Take the dedicated elevator 22 stories up to the industrial yet swank space—set with black-and-white tiled floors, bright globe lights and a beamed ceiling—to experience a hotel rooftop bar that has all the goods to be a standalone New York cocktail den, not just another hotel bar. Their mural “Every Night Should End With A Good Story” is definitely cheesy, but at A.R.T. SoHo it might just be true. 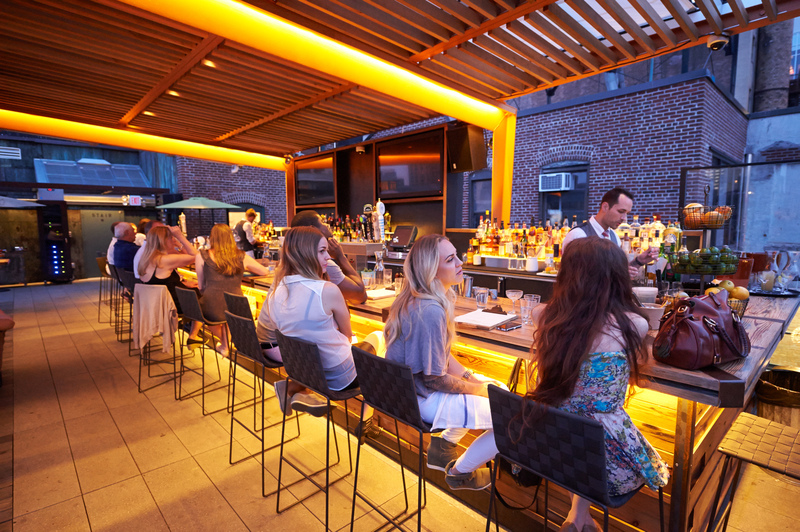 If the views of the Hudson River, flatbreads, and piña coladas aren’t enough to end the night on a high note, the people you’ll meet will at least be good fodder for your next cocktail party convo. Llama Inn serves up the best Peruvian bites in New York City. 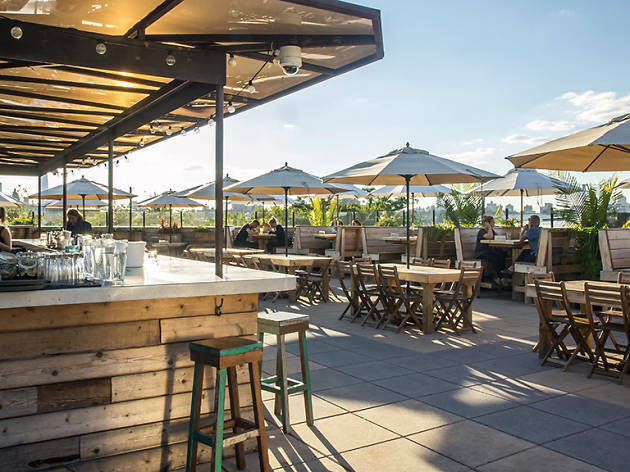 And although it’s been around for a few years now, few know that atop the plant-drizzled restaurant is Llama Inn’s rooftop bar, El Techo. Serving an entirely separate drink and food menu from their downstairs, you’ll not only be treated to an amalgamation of flavors that surprise the palate, but get to feel like you’ve got insider intel for discovering it. After a nightmarish day waiting to be called for jury duty, treat yourself to The Secret Side. 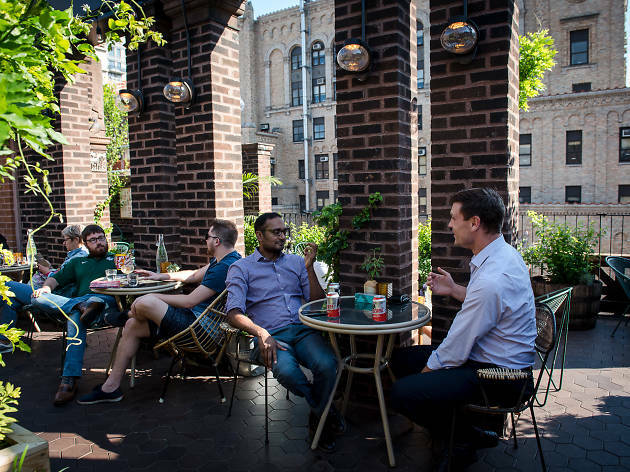 Formerly known as The Distillery, The Secret Side resides in Downtown Brooklyn’s The Tillary Hotel, nearby the Brooklyn courts, the Manhattan Bridge, Brooklyn Bridge and Barclays Center. 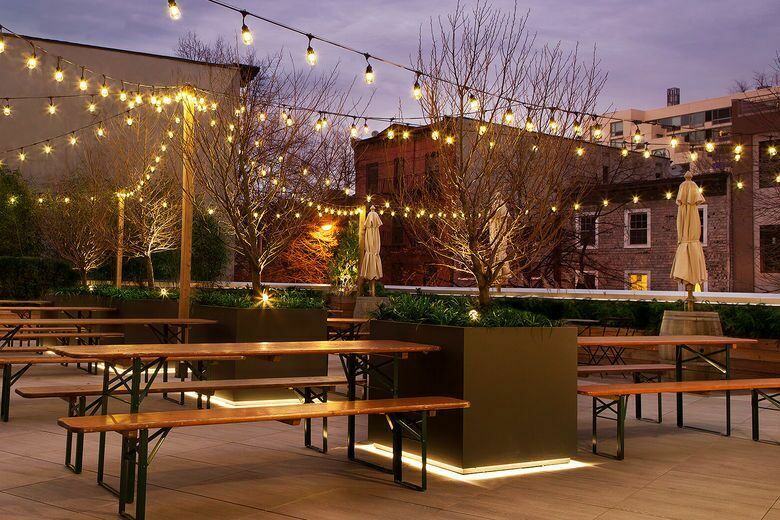 With affordable drinks ($5 bubbly) and a beer garden atmosphere, you’re guaranteed to wind down the right way. Oh, and did we mention the free popcorn? This past winter, the team collaborated with Veuve Clicquot to install igloos on their rooftop, so the fun won’t end with changing seasons. 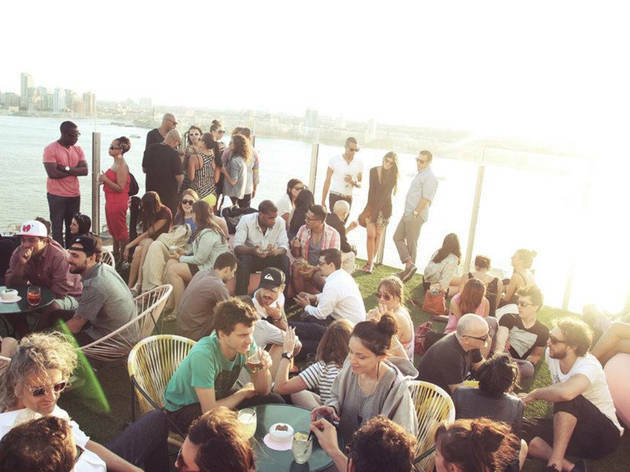 After an early surf in the Rockaways, take a breather at Bungalow Bar. Serving up brunch fare with cocktails like the “Eye Opener” (iced coffee, vanilla vodka, Baileys almande, kahlúa, chocolate syrup), here you can treat yourself to some beach day rest and relaxation. 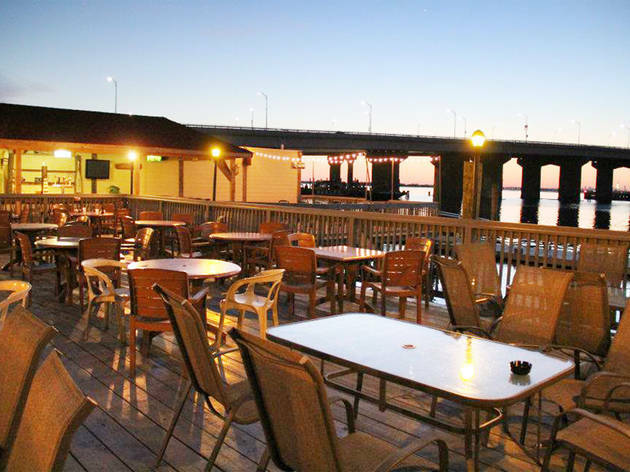 We suggest making reservations, because it does tend to get chaotic come warm-weather. Night of Joy may not have the sprawling multi-level rooftop or magical views that made you want to move to New York, but the people are what make it one of the best rooftop experiences around. 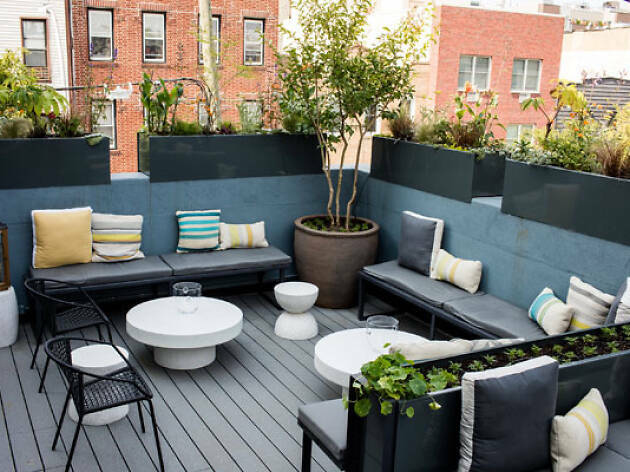 The intimate, quaint space is filled with young people looking to meet each other, and it may just be that cramped quarters play to your advantage here. 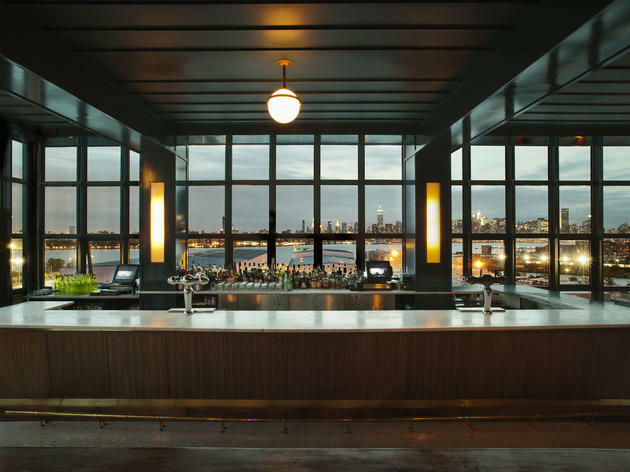 At this point, The Wythe Hotel feels like where you tell your parents to stay when they’re visiting you in Brooklyn. But the Ides still retains some of its same youthful energy. 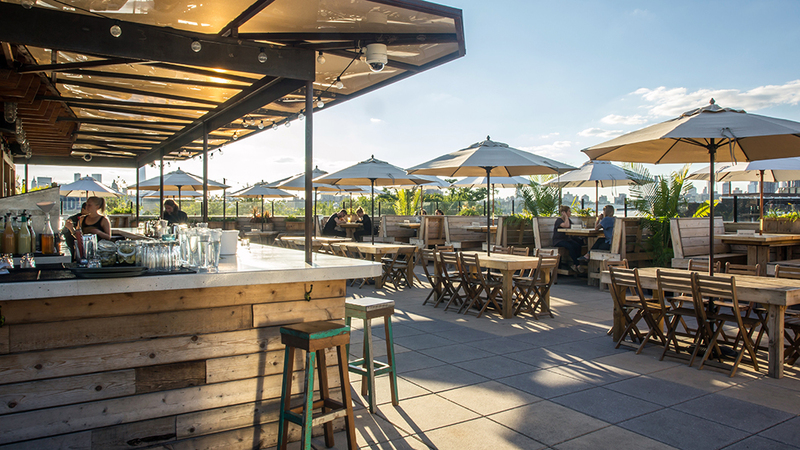 The sixth floor rooftop has sweeping views of the East River and Manhattan, and is an ideal vantage point for watching summer sunsets while lingering over a pint of beer made right here in Kings County. There aren’t any cute floral cushions or tropical drinks with umbrellas to be found at Northern Territory and that’s precisely why we love it. Northern Territory doesn’t need to hide behind aesthetics to be a damn good bar to grab a beer with a view. 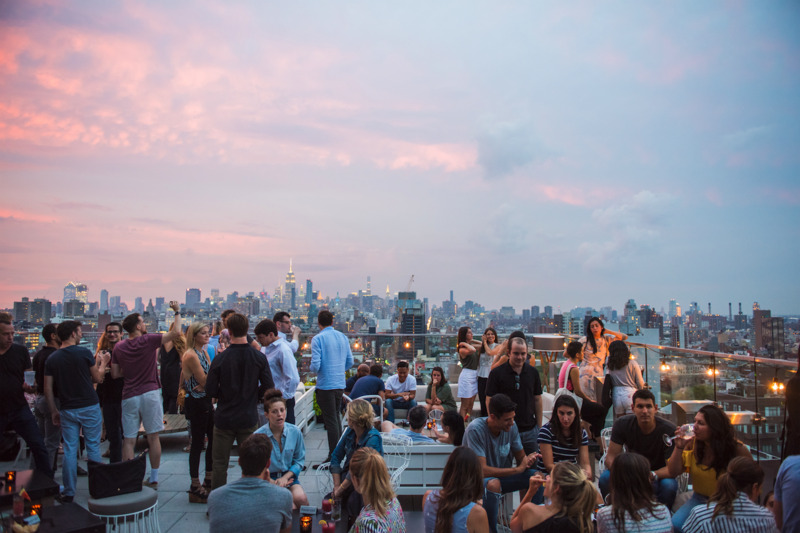 With a clear shot view of Manhattan and prime location (where Williamsburg meets Greenpoint), the skyline is the headliner. 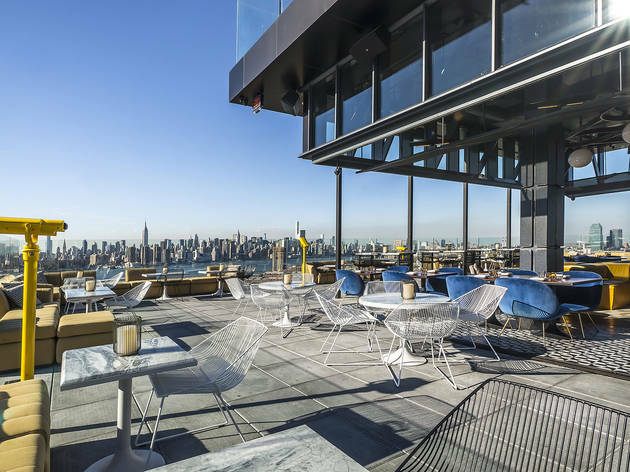 After a day of gallery-hopping, get an elevated view of the neighborhood at this panoramic rooftop bar and grill designed by architect Enrique Norten. On the menu you can expect to nosh on shared guacamole and cocktails that match the palette of their lime green sofas. A petite pool is the perfect spot to cool down in the summer and double duties as a hot tub come winter. You don’t go to Our Wicked Lady for fancy cocktails or even a stunning view. 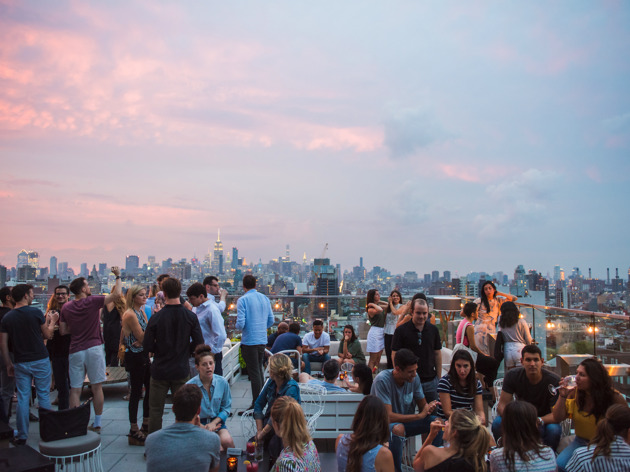 But it’s still fun as hell to hangout on their 1300 square foot rooftop, because you’ll bump into random people from all parts of your life. Don’t want to run into a one-night stand who ghosted you? Probably not the best place to drink on a Saturday night. 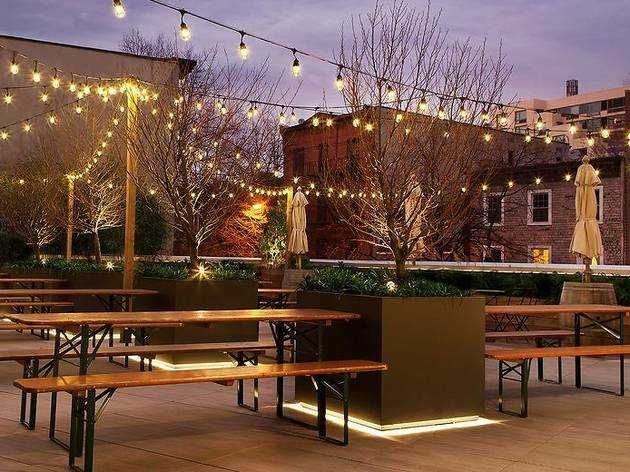 But if you do feel like escaping, downstairs the bar hosts comedy nights like ROFL with Edy & Eliza, a monthly stand-up show stirring up laughs. 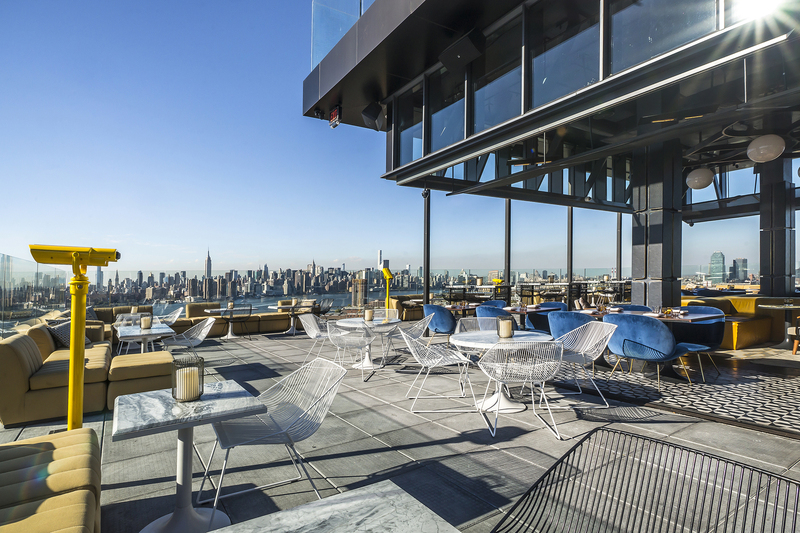 Located in the 50 Bowery Hotel, this swanky rooftop bar on the 21st floor has some sky-high snooping on Lower Manhattan. A menu by Top Chef alum, Dale Talde may set you back some serious dough but cocktails like the delicious “Coast is Clear” (Absolut Elyx, creme de violette, asian pear-ginger syrup, lime, soda) drink is worth the entry fee when paired with the view. 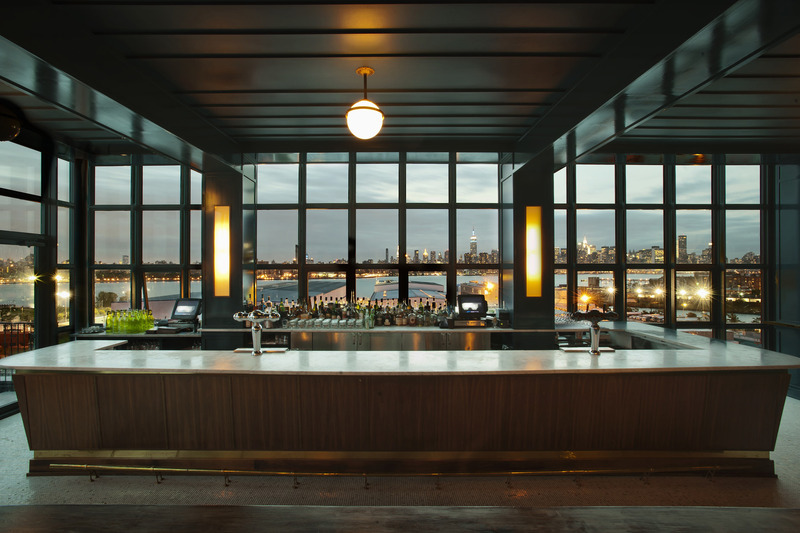 Inspired by Old Havana, this cuban cantina has 360 degree views of Lower Manhattan. The best part? 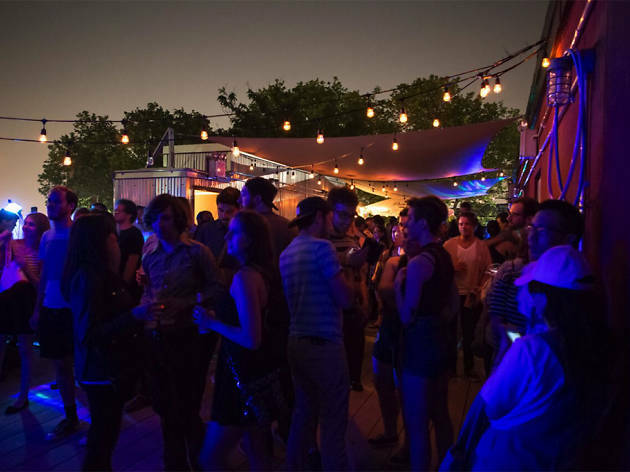 There’s live music and a weekly movie series where you can snuggle up and watch Cruel Intentions under the stars. 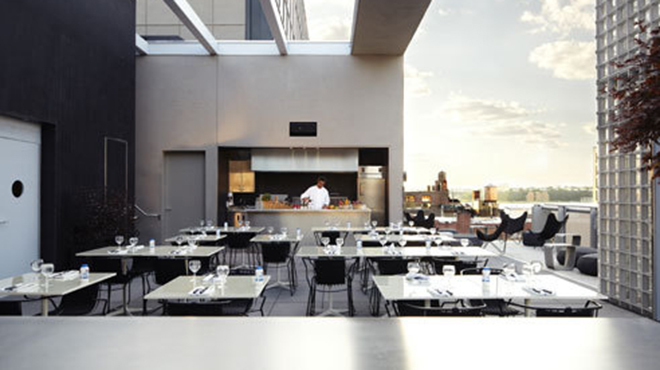 Luckily, you don’t have to be a hotel guest to have an entree into the action. 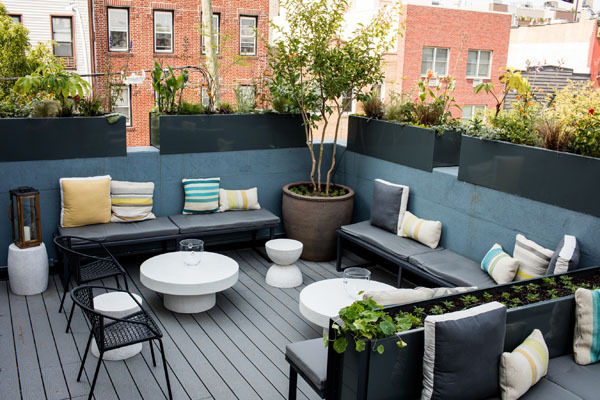 Ever since chef Angela Dimayuga (formerly of Mission Chinese) assumed her role as creative director of The Standard, Le Bain got cool again. 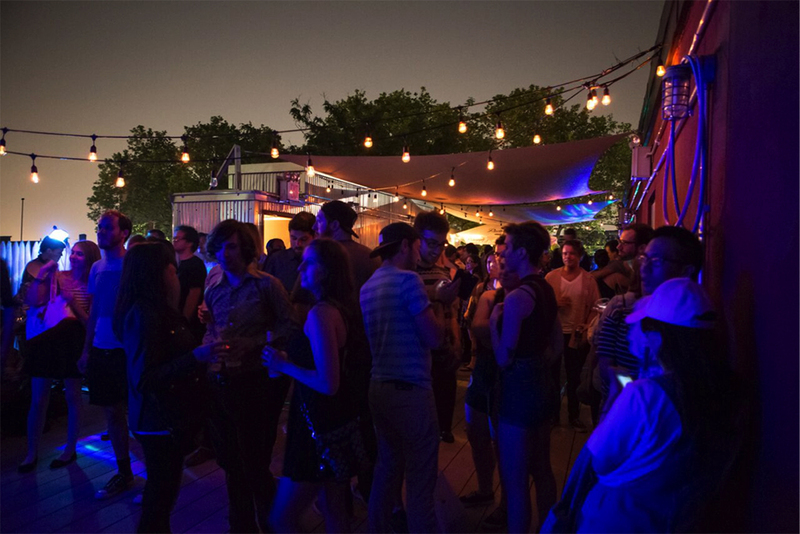 It’s not the kind of place we suggest for casually rolling through, but on nights when they have an event, it’s one of the best rooftop experiences in town. 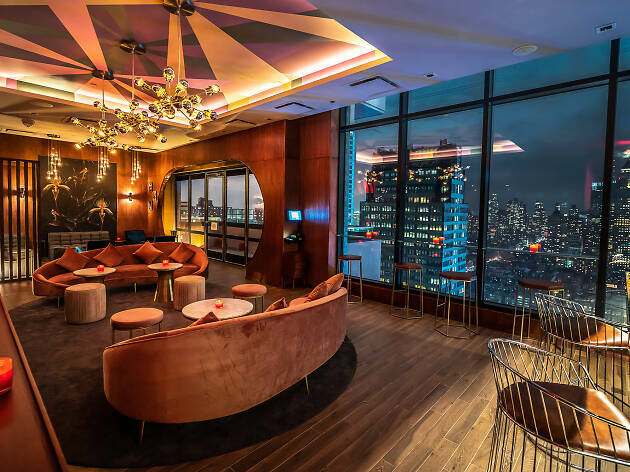 Expect the same wrap around windows that show off the New York skyline like it’s in a museum casing, alongside celebrity sightings and late-night dancing. 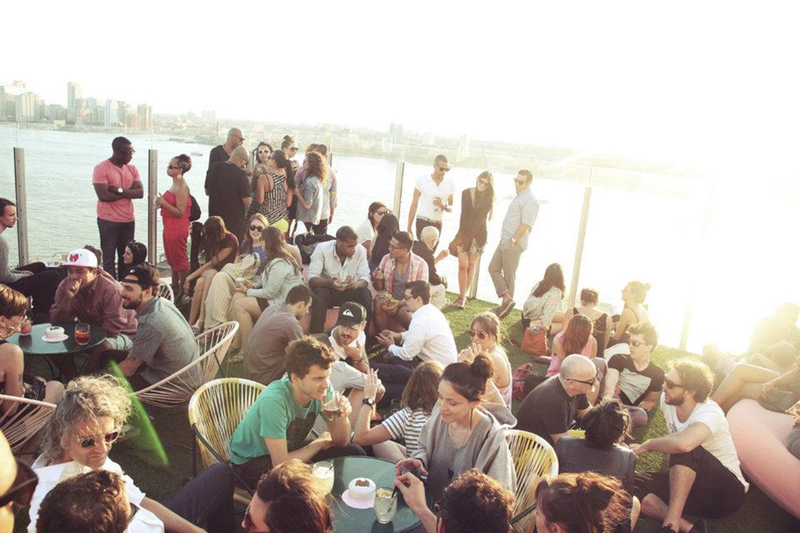 But in this era of Le Bain, there's also more queer-focused events that pull together the best of art, fashion, music and food. Things get hot in the jacuzzi. 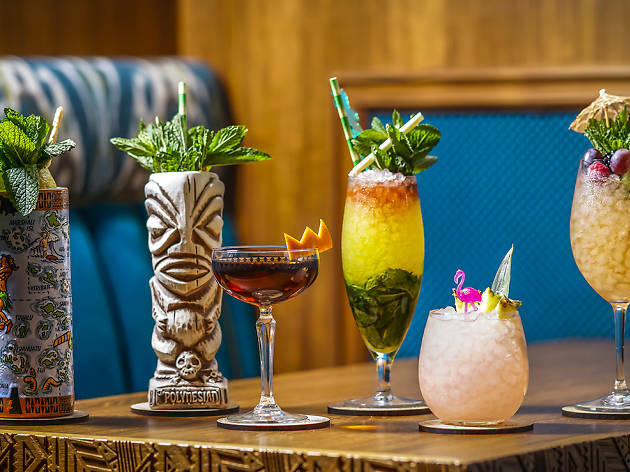 While a bar serving drinks in conch shells, boats and skulls in the heart of Midtown West might sound tacky, it's just as elevated and exciting as Major Food Group's other sought-after establishments. 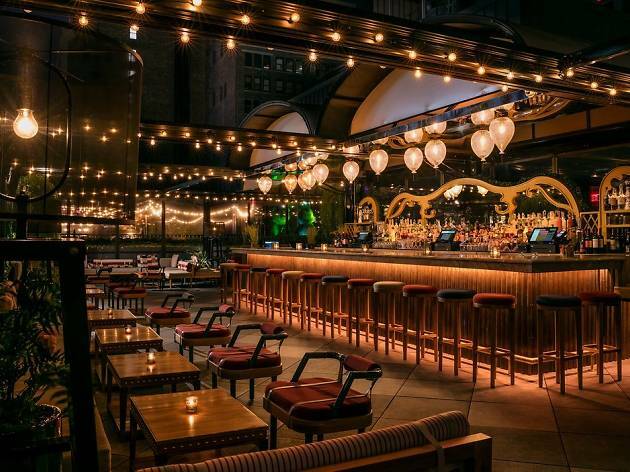 We wish the interior design of the bar was as meticulously thought out as the inside, but you can still get a sweeping view of New York from its terrace with their bomb cocktails, so it joins our list. 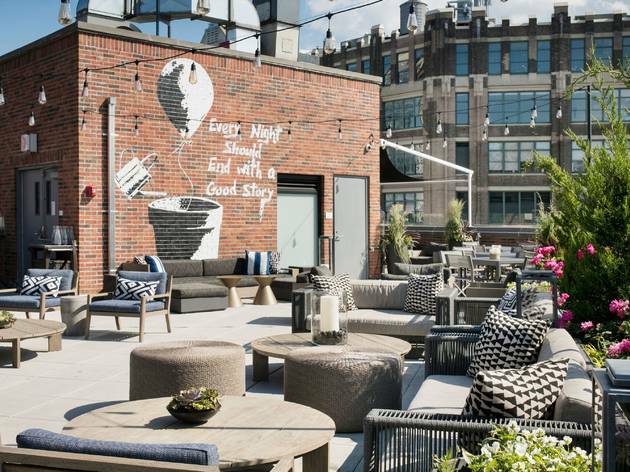 Want to drink at rooftop bars in other cities?